You are here: Home / General / Happy New Year! 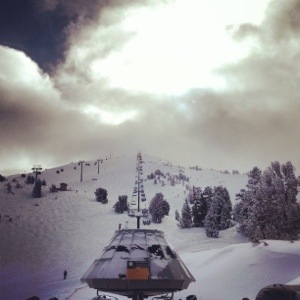 Snowboarding in Mammoth Mountain and More. 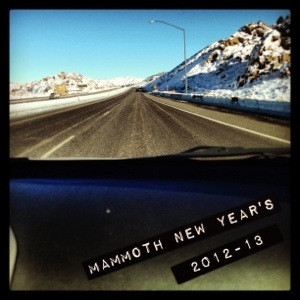 Happy New Year from Mammoth Mountain! 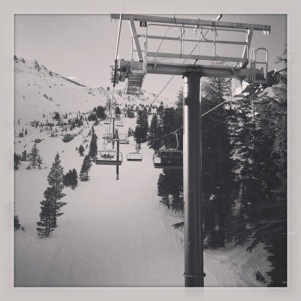 Happy New Year from Mammoth Mountain! I hope you all had a great end of year and got a chance to travel, relax, or catch up with family and friends. Every year for New Year’s, my husband and I go to Mammoth Mountain, Ca to snowboard and hang out with friends and family. Mammoth is located in the Sierra Nevada mountain range and about a five hour drive from Los Angeles. I have been a season pass holder to Mammoth Mountain since 2001 when I joined the UC San Diego ski & snowboard team and started competing in giant slalom and boardercross. UC San Diego was part of 14 schools that made up the Southern California Collegiate Snowsports Conference (SCCSC). While my racing days are over, the friendships I’ve made through snowboarding and being on the snowboard team during college will last a lifetime. There are 6 race weekends per season and all of our friends come from all over California to hang out with each other and get some snowboarding and skiing in. It’s a blast. One of the races is New Year’s weekend. 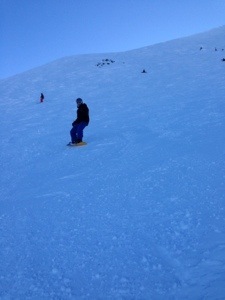 And on New Year’s Day in 2009 I taught my husband how to snowboard for the first time. Now he rips! 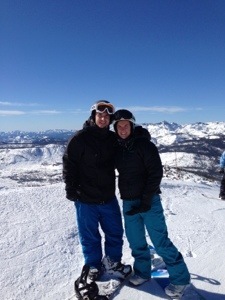 My husband Marion and I at the Top of Mammoth Mountain. Mammoth Mountain used to have this really awesome iPhone app that tracked your MPH, number of runs, and distance traveled on the mountain. It was super sweet. This year they disabled the app and replaced it with one that is, in my opinion, not as good. It didn’t track my distance properly so I was not that happy with it. If anyone knows of a good ski / snowboarding tracking app for the iPhone let me know! Snowboarding is quite a workout. I forget how intense it can be on your body. We snowboarded for 5 days straight, and wow, my legs are feeling it. 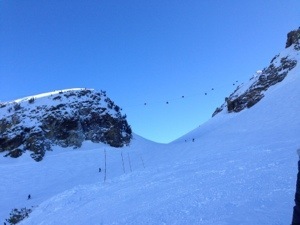 I do have to say that normally my body gets VERY sore from snowboarding and this trip I am not as sore as I normally am. I would like to think that it is attributed to my stronger core and slimmer self. It was quite an awesome feeling to put on snowboard pants that barely fit me last year and put them on this year with ease AND need a belt. That was my fit and awesome moment of the trip, for sure! I have heard that snowboarding is a great workout and I know it’s intense so I decided to find out how many calories you burn snowboarding. I was pretty impressed. I found a chart online that says you can burn 370-400 calories per HOUR snowboarding depending on your weight. That INCLUDES chair lifts and waiting in lines. Dang. I wish I lived in the mountains. I’d be super fit and awesome! 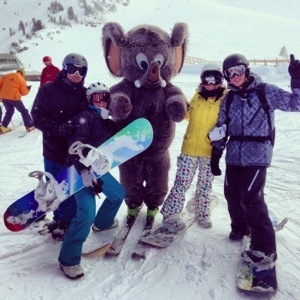 Woolly Mammoth is a superstar on the slopes. Whenever we see him, we have to grab a photo! Marion shreds Dave’s run. His first time on the classic run. 12/31/12. Beautiful way to end 2012. 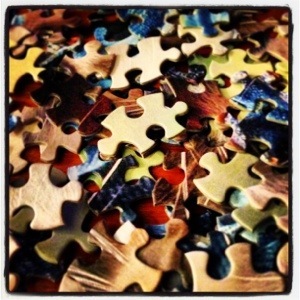 Jigsaw puzzle in the cabin after a day of riding. 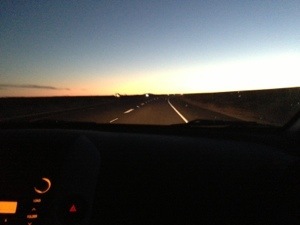 Traveling home to a beautiful sunset along the 395. What about you? Did you do something fun for New Year’s? 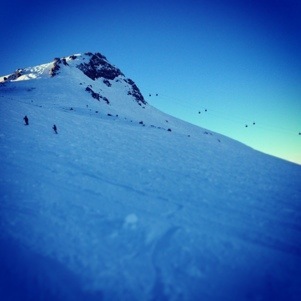 Do you like to go skiing or snowboarding during the winter? Post in the comments and let me know! Wonderful photos. Congrats on your fit and awesome moment! I want to get back into X-country skiing – did it growing up and it’s a great workout. Cross country skiing is a killer workout. Do you ever go snowshoeing with your pups? 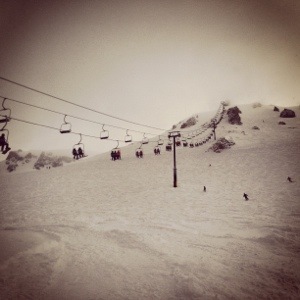 Thanks for sharing — loving the pics and didn’t know you were a hard-core boarder! I just got serious about the sport less than a decade ago; and yes, I love the amount of calories one burns doing so! Here’s to inspiring more people to your fit & awesome lifestyle in 2013! Oh yeah, surfing and snowboarding are my two main passions. I love action sports! Where do you like to go snowboarding? Thanks for the cheers. I hope to help more people in 2013 too! What are your race plans for this year?